After a few vacations you start to realize how small the world is. Social media is connecting everyone but on vacation you interact with people in a different way. Some people find the love of their life or some just find that special kind of connection with friends and family. Vacation is just like the first day of school. You don’t know everyone or sometimes you don’t know anybody at all. That feeling of being accepted or finding that right click is exactly what I mean. Going on vacation with family is already something that can create a stronger bond with them. You make time to get to know them better and to have lots of fun. This week we had some friends over and we wanted to show them the island. For some of them it was the first time on Curacao. A lot of tourists come here and just stay their whole vacation at the beach and then go back and complain they didn’t do anything at all and the island is boring. For us this was the right moment to show our friends why we love this island so much. Curacao has a lot of things to do and you can go out for parties every night. The only thing that always is missing is the adventurous activities people don’t usually do. So we brought them to the Blue Room. Not by boat like people normally do, but a 30 minute stroll alongside a hill in the rough nature of Curacao. To end up at a coral cliff where some of them had to conquer their fears. Jumping of a cliff or swimming in the deep blue ocean and seeing one of the diamonds of the island. 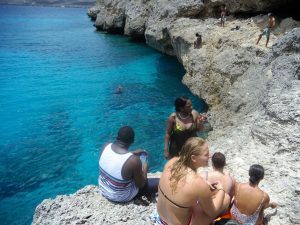 They all enjoyed it so much that we went to Klein Curacao the next day on a private charter. Some of them went on the boat and got sea sick. Yes, the boat ride to Klein Curacao can be a bumpy one. But is it definitely worth it. Spotting flying fish, sea turtles and sometimes dolphins. On the uninhabited little island there is not much to do but enjoy the beautiful turquiose sea, snorkeling or swimming with the turtles. For the adventures types they go to Lighthouse or the shipwreck, from there you can see Bonaire. The group was fun and everyone bonded with each other what made the trip so much more fun to do. We had enough food and drinks and party music that made this combination the perfect day. Mitchel and Carmela gave me and my friends an unforgetable holiday with memories to last us all a lifetime. They showed us parts of the island we would have never seen otherwise. Key Caribe is the best place to get your carribian holiday started. We stayed at the Livingstone Villa resort which also was very good choice. Very beautiful location, private and very comfortable. Key Caribe also took care of our car rental so we were also able to discover the island ourselves. I can give this company a perfect 10 and will advice this company to anyone who wants to vacation in the carribean!!! Our Idea of a Caribbean holiday is sun, sea and beach. Fortunately we bumped into an old friend, Mitchell from Key Caribe and he reminded us to open up a little more. So we did and before I knew it, we were jumping of cliffs, swimming into caves and even ‘bumped into a wolf in the wild’ (hahaha you had to be there to understand). We had fun, we partied and discovered so much more on Curaçao. Therefore a big THANK YOU to the guys at Key Caribe. Een paar weken geleden begon onze heerlijke vakantie op dit prachtige eiland. We verbleven op het prachtige Livingstone wat Key Caribe aanbied als accommodatie. Zeker een aanrader! Wat onze vakantie nog mooier maakten was de fantastische aanwezigheid van Mitchel & Carmela. Vol van enthousiasme hebben ze ons de weetjes en feitjes verteld over het eiland en ons meegenomen op ongekende avonturen. Hun hebben er voor gezorgd dat we niks te kort kwamen, alleen soms was slaap! HÁ! Ook het regelen van een auto is bij Key Caribe geen probleem. Keuze uit verschillende opties en goed verzekerd konden wij onbezorgd rond rijden op het eiland. Het was een vakantie om nooit te vergeten. Big Thanks for Key Caribe.